This dissertation deploys Elizabeth Grosz’s collected essays Architecture from the Outside: Essays on Virtual and Real Space (2001) as a means to engage latent formations associated with fashion and architecture. Specifically in ‘Future of Space’, Grosz describes a durational, non-determined potential of architecture generated by a ‘logic of invention’ that resonates with relationships between space, matter, body, movement and time. Grounded in the context of design research and architectural theory, the dissertation links Grosz’s description of durational characters of space (‘loci of intensity, compression and elasticity’) directly to contemporary fashion design. The dissertation concentrates upon Hussein Chalayan’s ‘Aeroplane Dress’, Rei Kawakubo’s ‘Dress becomes Body becomes Dress’ and Issey Miyake’s ‘Pleats Please’ and ‘A-Poc’, which can be associated with durational expressions through the body concepts and techniques deployed, and through their strategies for materiality, structure, detailing, fabrication and use. Architecture as a contemporary design discipline assumes at its core that while latent, emergent, durational aspects are integral to a design process, they may not always characterise its result – the architectural product – and may not be necessarily available to the user. 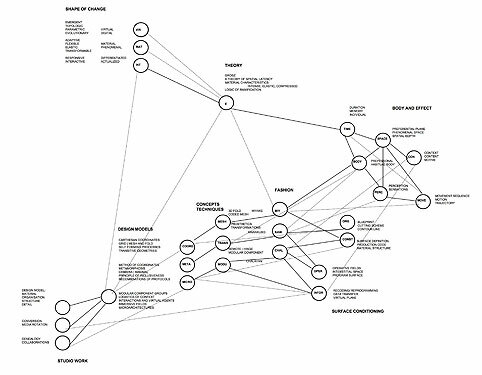 However, both Grosz’s theory of a spatial complexity and the mapped fashion works suggest the opposite: that durational qualities, latent organisations, and phenomenal effects can be mediated through the logic upon which they are based: inherent to the structure of their blueprint; their specific materiality; and their interaction with a user or wearer. In a unidirectional appropriation, the dissertation explores generative design principles and design models for durational space. The research suggests that these interdisciplinary design strategies are significant because they enable a departure from the blueprint, and resonate with a temporalisation and an intensification of architecture. The contribution of this dissertation is in the opening of a discourse that allows the latent durational qualities of fashion and architectural concepts and techniques to be engaged in architectural theory and architectural design methodology.